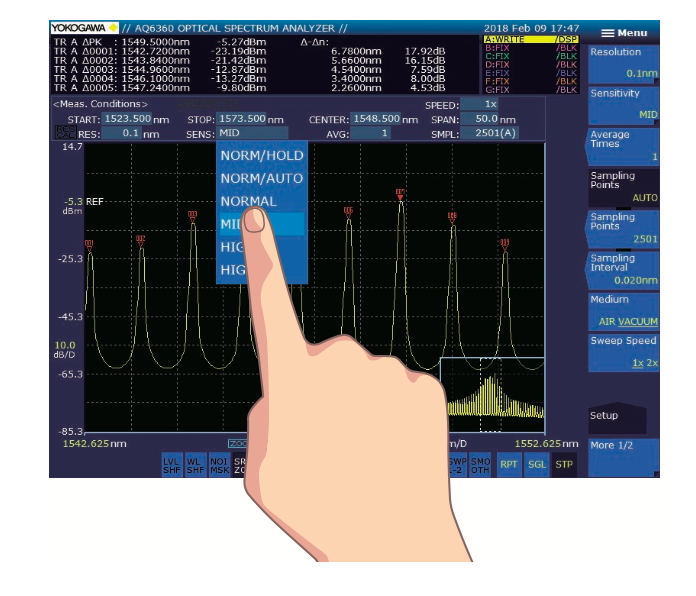 The AQ6360 is the fastest optical spectrum analyzer for optical device manufacturing offered by Yokogawa. 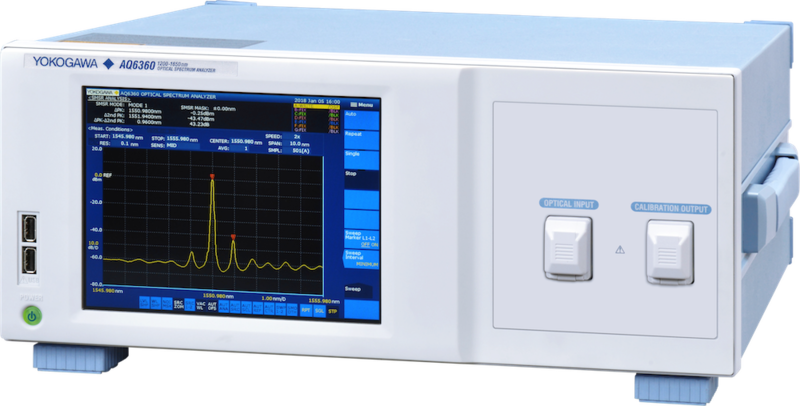 It is a cost-effective optical spectrum analyzer ideal for industrial manufacturing of telecom devices such as lasers, optical transceivers and optical amplifiers. The AQ6360 features a wavelength range of 1200 to 1650 nm for ideal manufacturing test performance. Its free space optical input structure design allows for guaranteed high coupling efficiency and measurement repeatability. Additional features and functions of the AQ6360 include built-in analysis functions and Ethernet and GPIB remote interfaces. The AQ6360 satisfies the typical measurement needs of industrial manufacturing of telecom devices such as lasers, optical transceivers and optical amplifiers. The AQ6360 can sweep up two times faster than our models designed for R&D purposes. The free space optical input structure is the most effective to guarantee high coupling efficiency and measurement repeatability. The AQ6360 inherits the screen and menu layout from our OSA lineup, which is recognized by thousands of users all over the world as the most intuitive and easy-to-use. Tap, drag, pinch in and pinch out. The high resolution, responsive 8.4-inch multi-touch capacitive touchscreen makes the operation of the instrument simple and intuitive. More than ten data analysis functions are available, including WDM (OSNR), SMSR, DFB-LD, EDFA, and Spectral width. The AQ6360 is equipped with GP-IB, and Ethernet interfaces for remote access and for building automated test systems. It is compatible with both AQ6370D and AQ6317 commands for easy programming. 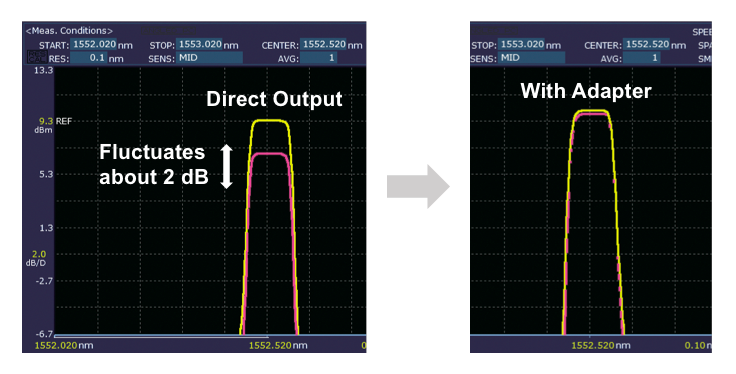 The AQ6360 delivers improvements in measurement throughput via a multimode fiber for free space laser beams from wafers, LD chip, TO CAN and TOSA measurements. This is due to the free space input structure of the OSA which accepts multimode fibers without high insertion loss, which occurs when multimode and single mode fibers are mismatched. 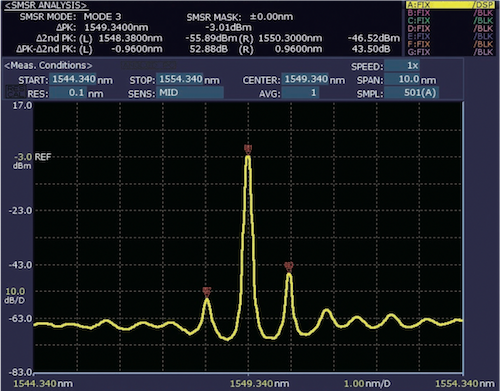 The side mode suppression ratio (SMSR) of laser can be measured quickly and accurately. The Numerical Aperture (NA) Conversion Adapter makes measurements with a multimode fiber more accurate and stable. It is a unique adapter designed specifically for Yokogawa OSAs. 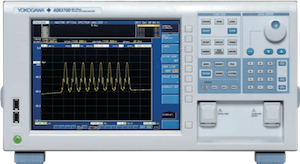 In conjunction with bit error rate test (BERT) equipment, the AQ6360 can measure the center wavelength and spectral width of transceivers and LD modules. For testing the BER curve of optical transceivers, the broadband light of an ASE source is added to signals. The high sensitivity of the AQ6360 enables it to measure OSNR conditions more accurately than low performance non grating based designs. 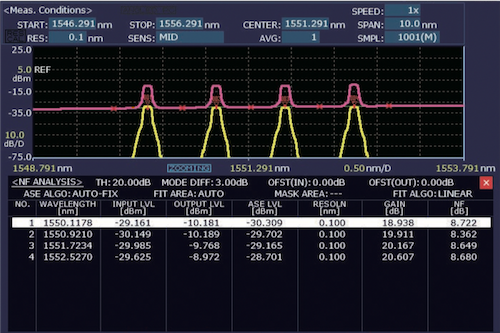 The AQ6360 has an automated function to easily calculate the Erbium Doped Fiber Amplifier Noise Figure under the name “EDFA-NF”. A typical measurement setup for amplifier testing consists of a set of multiplexed lasers, an attenuator for tuning the laser power level, an optical spectrum analyzer. The OSA takes two high-resolution spectrums. One trace is taken before amplification and one after amplification. From the obtained spectrums, the EDFA-NF Analysis Function automatically detects the laser peaks, extracts the required measurement values, performs the calculations and displays a table with the values of GAIN and NF of the DUT. Emission of CO2 about 25% compared to the previous model.